Wees, David. "Mint". The Canadian Encyclopedia, 04 March 2015, Historica Canada. https://www.thecanadianencyclopedia.ca/en/article/mint. Accessed 19 April 2019. Mint belongs to the mint family (Lamiaceae, also called Labiatae), a large plant family that also includes several aromatic and ornamental plants like basil, rosemary, oregano, thyme, coleus and sage. Mint is a good plant for a patio garden. Photo courtesy David Wees. Peppermint just starting to flower: the right stage for harvest. Photo courtesy David Wees. Mint belongs to the mint family (Lamiaceae, also called Labiatae), a large plant family that also includes several aromatic and ornamental plants like basil, rosemary, oregano, thyme, coleus and sage. Most species of mint are native to Europe or Asia but a few are native to Australia. Field mint (Mentha arvensis) is native to both North America and Europe. Mint has been used by various peoples in the Mediterranean area since at least 300 BCE. 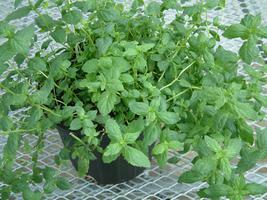 Mint is an herbaceous perennial plant, relatively winter-hardy and often a vigorous grower. Some species of mint such as corn mint (Mentha arvensis) and peppermint (Mentha x piperita) have escaped cultivation and become weeds. Mint plants have four-sided ("square") stems and opposite leaves. The leaves are usually more or less hairy, depending on the species. The mint plant produces clusters of tiny pink or white flowers at the tips of the stems in mid to late summer. 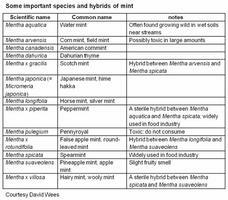 The classification of the numerous types of mint is complex with over 3000 species, subspecies, hybrids and varieties named. However, recent botanical research suggests that there are in fact only about 18 distinct species and 11 hybrids; the hybrids are naturally occurring crosses between two different mint species. Many of the hybrids produce no seeds as their pollen is sterile. Of the various types of mint, spearmint, peppermint, corn mint and Scotch mint are the most widely cultivated. Morocco is the world's leading producer of peppermint. Argentina, the USA and Spain are also important producers of mint. Canada produces only a small amount of mint but imports $3 to $8 million of mint oil annually, mainly from the United States. Although mint is grown in most parts of Canada, large-scale mint production in fields is mainly in the prairie provinces, particularly Alberta. Mint can also be grown in greenhouses for the fresh-cut herb market. Mint seed is very small (about 14 000 seeds per gram) and often fails to germinate. 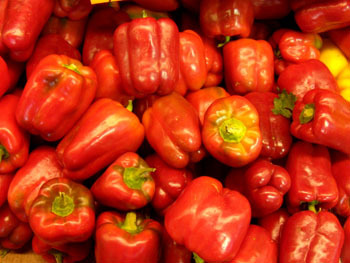 Even when it does germinate, the resulting plants are often very variable and different from the parent plants, meaning that they may look and taste different. Consequently, most farmers and horticulturists prefer to propagate mint by vegetative means: taking stem cuttings or by planting pieces of rhizomes or stolons (also called "runners"). By using these simple methods of cloning, one can be assured of the quality of the mint plants. The best quality mint is usually grown in areas with long day lengths during the summer; indeed, exposure to long day lengths increases the essential oil content of mint leaves. Thus, areas north of the 45º parallel, which receive more than 14 hours of light per day for most of the summer, are ideal. Mint grown near the equator may have high yields but low quality. Mint is generally harvested by cutting the tops (leaves and young stems) of the plants just before the flowering stage in mid to late summer; at this time, the mint flavour and odour are the strongest. Most types of mint grow best in moist soils. Therefore, in dry climates, irrigation may be necessary. 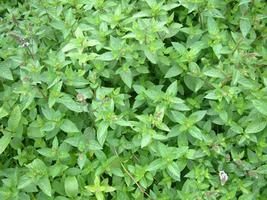 Several diseases can affect mint. The most common are "mint rust," which is caused by a fungus that leaves irregular rusty-brown spots on the leaves, and "verticillium wilt," another fungal disease that attacks the roots of the mint, causing them to rot. Mint can be used as a culinary herb, a medicinal plant, an ornamental plant, a source of flavouring for the food and beverage industry, as an insect repellent, in perfumery, in detergents and in cosmetics. Mint leaf tea, peppermint candies and mint jelly are some of the best known culinary uses of mint. Mint leaves and stems contain many chemicals called essential oils. These chemicals evaporate easily at room temperature and give a characteristic odour and flavour to mint. 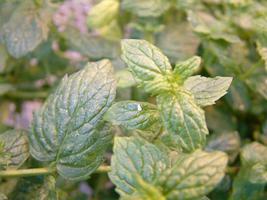 The most common essential oil in mint is menthol. Other common essential oils are menthone and carvone. Commercial mint oil is a blend of these and other essential oils. Mint oil can be extracted from mint herbage (fresh leaves, stems and flowers) by steam distillation. This involves chopping the herbage into small pieces then steaming it; the essential oils evaporate from the herbage then are collected and condensed. Mint herbage can also be dried but some of the essential oils are lost during this process. Mint has many uses as a traditional folk remedy as well as in modern medicine. Peppermint, because it contains menthol, has been suggested as an aid to digestion. However, in large amounts, menthol can cause allergic reactions and even be toxic. Pennyroyal (Mentha pulegium) has been used as an abortifacient in folk medicine but it is dangerous to consume as it can cause liver damage. 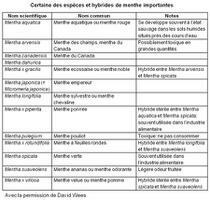 D. Wees, La culture en serre des fines herbes (2008); B. M. Lawrence (ed), Mint: the genus Mentha (2007); C. Landsburg, Quality evaluation of essential oil from Nova Scotia grown mint (1999), http://www.collectionscanada.gc.ca/obj/s4/f2/dsk1/tape2/PQDD_0021/MQ57302.pdf; E. Small, Culinary herbs (1997); V. E. Tyler, The honest herbal: a sensible guide to the use of herbs and related remedies (1993).